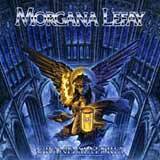 Morgana Lefay released their debut album in 1990, Symphony of the Damned. The band would record 5 albums by 1996, but then went dormant for three years. In 1999, Charles Rytkönen and Tony Eriksson decided to go forward with a new lineup. Due to legal issues with Black Mark (their label), the band was forced to shorten their name to Lefay. Meanwhile, the other three ousted members of Morgana Lefay released a self titled album (which has nothing to do with the band’s “true” sound) to merely fulfill contractual obligations. The Charles Rytkönen and Tony Eriksson led Lefay would release 3 albums under the Lefay moniker on Noise Records before announcing the breakup of the band in early 2001. In 2004, the band mended past differences with Black Mark, which brings us to where we are today. The band is once again known as Morgana Lefay, and Grand Materia is their big comeback album of 2005. Grand Materia proves that power metal doesn’t have to always be happy, with bombastic sing along choruses. Nothing against those type of bands, but I certainly give a lot of credit to Morgana Lefay for their different approach to power metal. Additionally, the guys infuse a moderate amount of thrash and some traditional metal elements into their sound. Vocalist Charles Rytkönen hasn’t missed a step over the years. His harsh and gritty voice is still as powerful as ever, really giving the songs on Grand Materia a serious energy boost. Despite his gritty and aggressive delivery on this album, he is more than able to tone it down and carry a melody when called for. Check out Emotional Sanctuary or One Endless Time Remains for some dynamic vocal displays. Speaking of One Endless Time Remains, I was a bit surprised to see this song in the number three spot. This is a nice ballad, yet still manages to feature heavy and deliberate guitar work. I would have pictured this song in the 9 or 10 spot as to provide the listener with a “break” later on in the album instead of at the beginning. Grand Materia provides the listener with a steady slab of bone crushing, heavy riff driven metal. The band uses a mix of mid tempo (but heavy) tracks such as the opening title track and full throttle, thrashy tracks such as My Funeral Is Calling and Edge of Mind. Morgana Lefay utilizes more catchy chorus lines on this album than they have in the past. However, that does not take away from the heaviness of the songs in the least bit. The band is able to write interesting and catchy songs without compromising the heavy and aggressive qualities of the album. The dark tone of most of the chorus lines gives the album a dark, somewhat doom vibe at times. As far as guitar work goes, I don’t think the guys could given a more “in your face” performance than they did on this album. As I said before, each of the songs features very thick, heavy riffs as a foundation. They employ more start-stop riffs on this album than they have in the past, which works really well for the band. This element of the guitar work blends perfectly with Charles Rytkönen’s voice to give the album a seriously heavy and aggressive feel. The rhythm section also pulls its weight in delivering this consistent wall of sound to your ears. The bass presence is authoritative, yet not domineering. I found the drum work to be particularly revved up on this album. You won’t find standard power metal double kick beats or monotonous drum fills on this album. Instead, the drum work is intense and varied throughout the album. Particularly during the more thrashy moments of the album, you’ll hear some neck breaking drum work that just goes perfectly with the rest of the music. Welcome back Morgana Lefay! Hopefully, the hardships and drama are left in the past, and the guys will continue to dazzle us with their excellent brand of thrashy power metal for years to come. In my mind, Morgana Lefay have been one most consistent, yet seemingly overlooked bands of the past 15 years. Perhaps Grand Materia comes at just the right time to finally give Morgana Lefay a larger spotlight in the metal world. It’s no secret that the power metal genre has become littered with dozens of cookie cutter bands since Lefay’s last album 5 years ago. As a result, many have nearly written off the genre. As I said before, Morgana Lefay have proven that power metal doesn’t have to be happy go lucky all the time with high pitched vocals. Grand Materia is a superb album of thrash tinged power metal that sticks out from the crowd. With Charles Rytkönen’s aggressive and gritty vocals, a heavy guitar onslaught, and memorable songs, this album is surely a highlight for 2005.